What do Notched IZOD of 14 J/m, post-cured, and ASTM D 256-10 actually mean? What’s the difference between strength and modulus? How do they relate to common materials that we come across every day, and why does it matter to you? Material properties such as chemical, optical, mechanical, thermal, or electrical characteristics reflect how a specific material will behave under certain conditions. As quantitative metrics, these attributes can help you assess the benefits of one material versus another for a specific use case. In the following, we’ll describe the most widely used mechanical and thermal properties, their importance for specific applications, and how 3D printed materials relate to plastics manufactured with traditional methods to help you make the right material decisions. Tensile Strength Resistance of a material to breaking under tension. Fundamental property that shows the ultimate strength of a part. High tensile strength is important for structural, load bearing, mechanical, or statical parts. Young&rsquo;s Modulus Resistance of a material to stretch under tension (stiffness). Good indicator for either the stiffness (high modulus) or the flexibility (low modulus) of a material. Elongation Resistance of a material to breaking when stretched. Helps you compare flexible materials based on how much they can stretch. Also indicates if a material will deform first, or break suddenly. Flexural Strength Resistance of a material to breaking when bent. Similar to tensile strength, but shows strength in bending mode. Also a good indicator if a material is isotropic (homogeneous). Flexural Modulus Resistance of a material to bending under load. Good indicator for either the stiffness (high modulus) or the flexibility (low modulus) of a material. Impact Strength Ability of a material to absorb shock and impact energy without breaking. Indicates toughness, helps you figure out if a part will survive when dropped on the ground or crashed into another object. Indentation Hardness (Shore) Resistance of a material to deformation. Helps you identify the right “softness” for rubber and elastomers for certain applications. Compression Set Permanent deformation remaining after material has been compressed. Important for elastic applications, tells you if a material will quickly spring back into its original shape. Tear Strength Resistance of a material to growth of cuts under tension. Important for flexible materials, such as rubber or textiles. Shows the resistance to abrasion. Water Absorption Amount of water absorbed under specified conditions. Mostly important during the processing of the raw material, high water absorption or humidity can lead to poor material properties in thermoplastics. Heat Deflection Temperature Temperature at which a sample deforms under a specified load. Indicates if a material is suitable for high temperature applications. Vicat Softening Point Temperature at which the material becomes noticeably soft. Used for materials that have no definite melting point. For high temperature applications it helps determine the upper temperature limit for continuous use. Thermal Expansion Tendency of a material to expand (or shrink) in response to a change in temperature. Important for applications where a shape change in response to temperature is unacceptable or desirable. Materials properties are most reliably measured by standardized test methods. Many such methods have been documented by their respective user communities and published through ASTM International. Naturally, the exact metrics for your parts are dependent on their designs, but comparing standardized tests will give you an indication on how your part will behave when manufactured from different materials using different methods. Green / Postcured: Material property before and after curing, specific to the stereolithography (SLA) process. Learn more about curing. ASTM D 256-10: Identifier of the standardized method. In an ideal world, you’ll find similar materials tested with the same method, but there’s no good way to compare an RC plane to a Boeing 747. Now that we have a clear understanding of the basics, let’s look into each material property in detail and talk about benchmarks for materials made with traditional manufacturing methods, as well as common 3D printing technologies including Fused Deposition Modeling (FDM), Stereolithography (SLA), Selective Laser Sintering (SLS) and PolyJet. One of the most fundamental material properties is tensile strength, a material’s resistance to breaking under tension. It’s one of the first material properties engineers look for and is found at the very top of most material datasheets. In conjunction with a sufficient ductility, tensile strength also indicates a material’s toughness. Some materials break very sharply in a brittle failure, whereas more ductile ones, such as most plastics and metals, experience some deformation. To clearly understand this behavior, tensile strength data is commonly supplemented with a stress/strain curve. Materials of high tensile strength are typically found in structural, mechanical, or static components where a breakage is unacceptable, such as construction, automotive, aviation, as well as wires, ropes, bullet proof vests, and more. Today, 3D printing has progressed to the extent where it is able to deliver the same, or even higher tensile strength than traditional injection-molded plastics, such as polypropylene and ABS. The Young’s Modulus, or elastic modulus, is a measure of a material’s stiffness under tensile load. The higher the Young’s modulus, the stiffer the material. On the upper end of the scale, Young’s modulus quantifies a material’s shape fidelity under load, making it one of the first properties you should examine when selecting materials for any load bearing mechanical and structural parts that are expected to remain inside their geometric specifications under load. A low Young’s modulus, on the other hand, indicates an elastic material. Hence, on the lower end of the scale, the Young’s Modulus allows you to get an insight into the elasticity of a soft and flexible material. The extent to which a material stretches just at the moment of breaking is called elongation. Defined as the ratio of the extension over the initial, unloaded length, it expresses the capability of a material to resist changes of shape without crack formation. Stiff materials, such as brittle-hard plastics, typically feature a low elongation at break, while some soft, elastic materials can stretch several times their own length before breaking. When choosing a flexible material for a specific application, elongation tells you how much it can stretch. Elongation is also important in construction and architecture, where structures should deform noticeably instead of collapsing immediately. If given, the elongation can be deduced from a material’s tensile strength and tensile modulus, it is therefore a partly redundant measure. Similar to tensile strength, flexural strength describes a material’s resistance to breaking under load. The difference lies in the type of the load, which for flexural strength is in bending mode, therefore reflecting both a material’s compressive and tensile strength. For most plastics, flexural and tensile strength align closely together. In fact, if a material is isotropic (homogeneous), its flexural strength is the same as its tensile strength. Due to the strong chemical bonds across the 3D prints, SLA parts are isotropic. This represents a major advantage compared to other 3D printing technologies, as parts have comparable strength regardless of the orientation. The flexural modulus is a measure for a material’s stiffness in bending direction. A high flexural modulus indicates a stiffer material, while elastic materials will have a lower flexural modulus. Just like tensile and flexural strength, tensile and flexural modulus are close related and typically don’t differ largely. Flexural modulus is an important metric for applications such as steel springs&ndash;in particular leaf springs, as well as support beams, or structural parts. Materials can respond differently to static loads than to sudden impacts. The ability to absorb this sudden energy during plastic deformation is the toughness of material. Defined as the amount of energy a material is able to absorb from a sudden impact or shock without breaking, impact tests are a great indicator of toughness. Brittle materials have low toughness as a result of the small amount of plastic deformation that they can endure. Generally, at lower temperatures the impact energy a material can absorb also decreases. Impact strength is an important factor in many applications from enclosures to shields and safety goggles. The IZOD impact test and the Charpy impact test are two common tests for impact strength that differ only in the way they are being measured, with the former being the ASTM standard. Hardness is defined as a material's resistance to permanent shape change when a compressive force is applied. In practice, hardness is synonymous to scratch resistance as well as resistance to indentation and elastic deformation. Counterintuitively, hardness and toughness are mutually exclusive. Hard materials are naturally brittle, whereas toughness requires a material to feature certain ductility. While a low hardness generally indicates a soft material, the above hardness definition becomes increasingly impractical the softer the material is under test. This is where the Shore durometer (or Shore hardness) comes in&ndash;a testing method and definition dedicated to measuring the hardness (or softness) of soft, flexible, and elastic materials such as rubber, elastomers, and some polymers. In practice, the Shore durometer is often used to identify suitable materials for soft touch surfaces, such as a grip handle, or the right rubber for a specific gasket. The durometer is also an important measure for rollers and solid tires. A high Shore hardness indicates a harder and less flexible material, while a lower value indicates a softer material. If a datasheet does not mention a value for the hardness, a low tensile modulus can also be a good indicator for an elastic and soft material. The ASTM testing standard calls for a total of 12 scales, with the A scale being the most common for softer plastics, and the D scale for harder ones. Compression set is commonly used to describe the permanent deformation remaining in a soft material, such as an elastomer, after a compressive force is removed. Materials with a high compression set are unsuitable for applications where a part is expected to quickly jump back into its original shape after a compressive force is removed, such as springs. For dampeners or gaskets a high compression set may be acceptable or desired. Tear strength describes a material’s resistance to tearing, more specifically to the growth of cuts and their propagation through the material under load. Materials with a low tear resistance tend to have poor resistance to abrasion and will quickly fail when damaged. Tear strength is an important factor when selecting flexible materials such as rubber or textiles for highly tensile applications. Materials used for tensioned membranes, drums or sailcloth, elastics, and bungees need to resist tearing even after initial damage, and therefore require a high tear strength. Plastics absorb a certain amount of water from humid air or when immersed in water. Although some plastics are more hygroscopic than others, for the final plastic products, this minuscule water absorption is rarely of relevance. However, it does play an important role in the processing of the raw materials and in the heat resistance of plastic parts. When heated above a certain temperature threshold-typically around 150 - 160°C, in the presence of humidity many thermoplastics undergo a chemical reaction called hydrolysis, which cracks long molecule chains into shorter ones and weakens the material. If a thermoplastic raw material with a high water absorption is exposed to humidity prior to 3D printing or injection molding, hydrolysis occurs during the process and results in poor material properties of the final part. Therefore, thermoplastic raw materials with high water absorption require being stored in a dry environment. While injection molded plastics (ABS, nylon, polypropylene) are thermoplastics, SLA photopolymers resins are thermoset materials&ndash;they’re cured with a light source instead of melted into shape, and remain in a permanent solid state after curing. As a result, they’re not susceptible to the negative effects of hydrolysis. Material properties, especially tensile and flexural moduli, are bound to the standardized environmental conditions under which their test results have been recorded. Different environmental conditions, such as a different ambient temperatures, can result in a drastic change of a material’s performance under load. The heat deflection temperature (HDT) captures the temperature at which a material starts deforming under a specific load. A high HDT is desirable for high temperature applications such as enclosures and mounts for heating elements, and components which come in contact with hot liquids or gasses such as tooling for injection molds, fluidic connectors, valves, and nozzles. Unlike other materials, plastics do not feature a sharp melting point. The Vicat softening point acts as an alternative definition of the point at which a material starts to flow and fills this gap for plastics and thermoplastics. Just like the HDT, the Vicat softening point captures the change of a material’s mechanical properties under influence of heat. It marks a temperature point where a standardized needle indents a test specimen a given length, with a given load applied. It is commonly used to determine the upper temperature limit for continuous use of a material in an application at an elevated operating temperature, which, as a rule of thumb, should lie 15 °C below the Vicat softening point. Materials tend to shrink, expand, or otherwise change shape depending on their temperature. This phenomenon is utilized in thermal actuators, thermal sensors, and even artificial muscles&ndash; but in most cases it is an undesirable side effect and needs to be effortfully mitigated. The thermal expansion coefficient is a helpful indicator to predict and quantify how a material changes its shape in response to temperature changes. A positive thermal expansion coefficient indicates that the material expands with increasing temperature, while a negative metric indicates a shrinkage. When working with thermoplastics, be it through injection molding or 3D printing, the thermal expansion of the material must be taken into account to obtain the desired shape after the part has cooled down. To prevent thermal phenomena such as hoop shrinkage, curling, and warping, which are major limitation in achieving geometric precision through 3D printing technologies such as SLS and FDM, it is advisable to take the thermal expansion coefficient into account when choosing the material. Thermoset 3D printing technologies, such as SLA, generally don’t suffer from thermal distortions, which makes them an excellent choice for parts where highest accuracy and shape fidelity is required. To understand material properties, we need to start with the stereolithography process and its raw material, the resin. Plastics are made out of long carbon chains, whereas resin is a plastic composed of short(er) carbon chains. It has all of the components of the final plastic, but hasn’t been fully polymerized yet. When the resin is exposed to light, the chains are joined together by photoinitiators to create much longer and stiffer chains, and thereby solid objects. This technology provides a unique freedom to create various formulations. Different resins consist of different backbones and side groups—different combinations of long and short monomers as well as additives. The results are plastics with a wide range of characteristics, from clear to opaque and colored, flexible to rigid, tough to heat resistant. Due to the layer-by-layer nature of 3D printing technologies, in many cases material properties vary to some degree according to the direction in the material in which they are measured, a condition referred to as anisotropy. For example, a 3D printed object may have different elongations at break or stiffness in the X, Y, and Z directions. During the SLA 3D printing process, the components of the resin form covalent bonds providing high degree of lateral strength, but the polymerization reaction is not driven to completion; rather, the print process is modulated in a way that keeps the layer in a semi-reacted state called the “green state.” This green state differs from the completely cured state in one very important way: there are still polymerizable groups on the surface that subsequent layers can covalently bond to. As the next layer is cured, the polymerization reaction will also include the groups on the previous layer, thus forming covalent bonds not just laterally, but also with the previous layer. This means that on a molecular level, there is little to no difference between the Z-axis and the XY plane in terms of chemical bonds; each continuous part printed on an SLA machine is isotropic. Learn more about isotropy and see test results of SLA 3D printed parts. Once the stereolithography process is completed, the printed parts remain on the build platform in the aforementioned green state. While they have reached their final shape and form, the polymerization reaction is not yet completed and therefore mechanical and thermal properties are not set. Adding a post-cure chamber to the printing process finalizes the polymerization process and stabilizes the mechanical properties. This enables parts to reach the highest possible strength and become more stable, which is particularly important for functional resins for such Castable, Dental SG, High Temp, Flexible, and Tough. For example, post-curing is required for a successful burnout with Castable prints, and Flexible resin doubles its strength with post-curing. Find tests results and read more about how post-curing influences mechanical properties in our white paper. Photopolymer resins are thermosetting plastics, as opposed to thermoplastics. Though they sound similar, their properties and applications can be quite different. The primary physical difference is that thermoplastics can be melted into a liquid state and cooled multiple times to form various shapes, whereas thermoset plastics remain in a permanent solid state after curing. Formlabs resins were designed to simulate a range of injection-molded plastics, covering the full spectrum of properties required to conceptualize, prototype, test, and manufacture successful final products. Standard Resin provides high resolution and fine features right out of the printer, making it ideal for rapid prototyping and product development. It has the highest tensile strength of our some of highest tensile and flexural moduli. Tough was designed to simulate ABS plastic, with comparable tensile strength and modulus that is ideal for prototyping functional parts, such as enclosures, snap-fit joints, and assemblies. With a high elongation and impact strength, it’s the resin with the highest toughness. Durable simulates polypropylene (PP) plastic, with comparable low modulus and high-impact strength for prototyping consumer products, packaging, or low-friction, low-wear moving parts. High Temp has an HDT of 289 °C @ 0.45 MPa—the highest on the 3D printing materials market. It is ideal for static applications that will undergo higher temperatures, such as injection molding and thermoforming. Flexible simulates an 80A durometer rubber for simulating soft-touch materials and adding ergonomic features to multi-material assemblies. A comparison of Formlabs resins. Looking for more information? 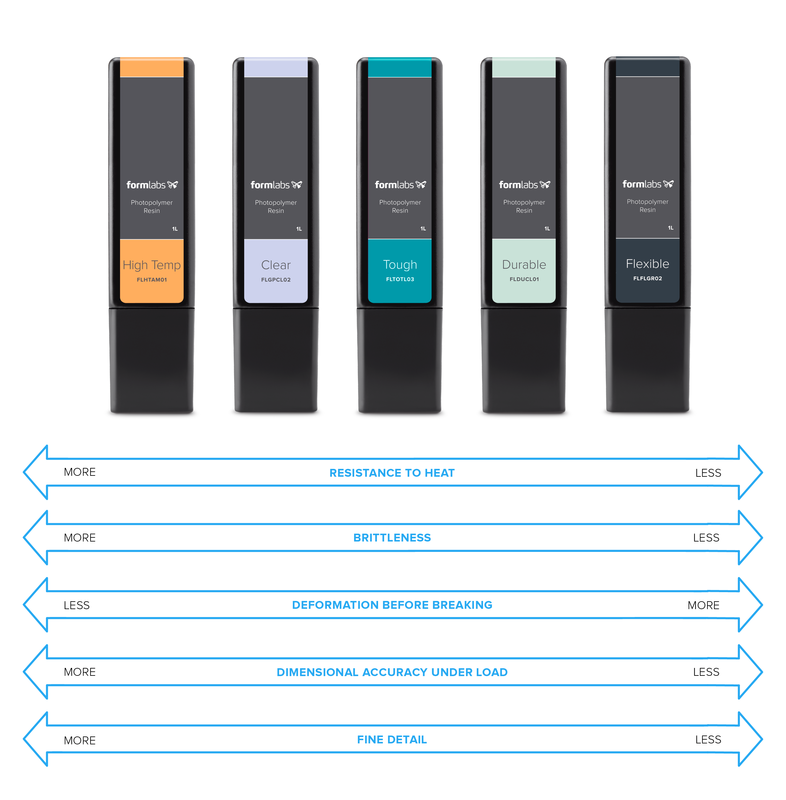 Download the full material datasheet of Formlabs resins to compare metrics or contact an expert and get advice based on your specific application.